Duck stamps, issued annually by the US Fish and Wildlife Service since 1934 to purchase wetland habitats across North America, have become hugely popular with collectors of American stamps over the past 75 years, while those pursuing a bird thematic have also dabbled. 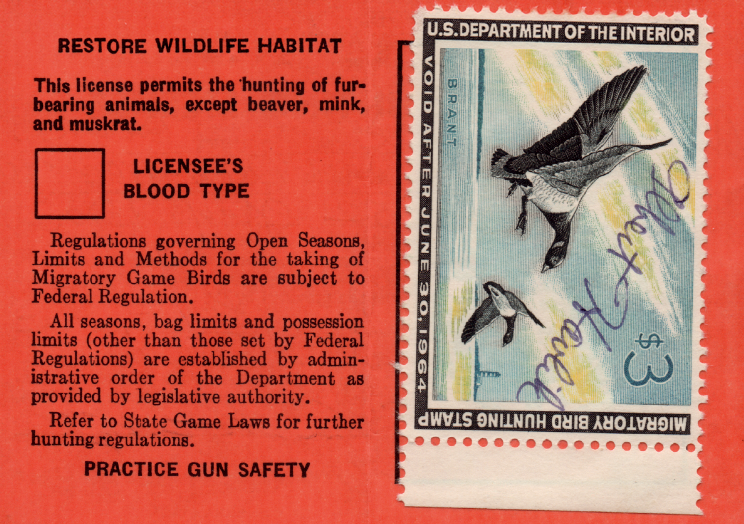 Yet their unique nature - a form of revenue stamp issued by a government to validate a licence to hunt migratory waterfowl - and the beauty of the designs, means collectors of all kinds and nationalities have taken an interest. Where does the money from duck stamps go? The stamps also have an obvious appeal to anyone with more than a passing interest in wildlife and conservation. They allow free admission to US refuges and are a good way to contribute to the future of the country's wetlands, since 98 cents from every $1 is used for this purpose. It is this dual appeal that means over a million duck stamps are sold each year. But it is not just migratory wildfowl who are helped out, hundreds of other species benefit from the sale of the stamps. How much do duck stamps cost? For collectors outside of the USA the cost of the annual duck stamp can be a little off-putting. The current price per stamp is $25, with legislation set to increase the price to $35 after 2020. Yet collectors concerned with the financial implications are also keenly aware of the investment value of much of the material. ‘I suspect the cost of the stamps is a major factor towards the small number of collectors in the UK,’ reflects John, ‘and yet even a small collection can become quite valuable.’ Since only a finite number of duck stamps are produced each year and all surplus stamps are destroyed after three years, values can steadily rise following the issue, while the first stamps, issued during the 1930s are, naturally, the most valuable. 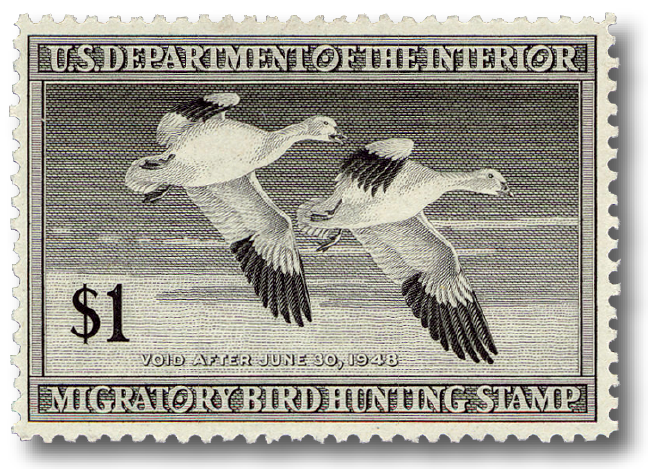 The idea for a duck stamp, officially known as Federal Migratory Bird Hunting and Conservation Stamp, was born in 1920, when George Lawler, the chief game warden of the Bureau of Biological Survey, proposed the idea of a federal hunting stamp which would fund refuges for migratory wildfowl. The demand for wildlife refuges had come to light over the previous decades during which the control on hunting was limited, population and development soared (between the World Wars an estimated 100 million acres of wetland was drained and used for other purposes) and the number of ducks dwindled. Yet the decline in economic fortunes that led to the Great Depression meant the idea of raising money to reinvigorate the duck’s habitat was put on hold as politics turned to the welfare of those citizens with their feet firmly on the ground. President Hoover’s introduction of the Migratory Bird Conservation Act in 1929 began the difficult process of justifying funds for wildlife, but FD Roosevelt’s initial resistance delayed a more significant programme. It took popular and extrovert Pulitzer-prize winning cartoonist, hunter and conservationist Jay Norwood ‘Ding’ Darling, to push the necessary legislation through Congress, and in August 1934 the first duck stamp was finally issued. While spending money on wildlife conservation was not top of Roosevelt's priorities, the idea of a stamp would have excited the President who took a keen interest in postal stamps, collecting them himself and often suggesting designs. Darling himself drew the ‘Mallards Dropping In’ sketch of a male and female mallard about to land on water and just over 600,000 $1 stamps were produced by the US Postal Service on behalf of the US Fish and Wildlife Service. Today the first stamp has a value of around $500 (approximately £322) in fine condition, with the value of each annual stamp falling each year. The premise of a stamp allowing hunters to kill wildlife while raising funds to protect it was ironic to say the least, but the system worked and soon hunters began affixing the stamp to their hunting licenses - they would also be required to add their signature from 1935 onwards. From the second year on collectors were also allowed to purchase the items. Yet the second issue, showing three canvasback ducks in flight with a subtly added boat of hunters lurking in the background, is today the rarest since only 400,000 copies were issued. How are duck stamps designed? With so many entries coming in, it was later decided that the competition should be opened to anyone who wished to enter. 'By the early 1950s, the Service had opened the Federal Duck Stamp Contest to the public and had developed submission guidelines dictating such things as the size of the art and that the art must depict wild American waterfowl,' Patricia adds. Since the Federal Duck Stamps are only issued annually the demands on a collector's time and finances is limited, yet with a selection of related products there is always something to keep the completist hunting. Perhaps the most logical step for those hooked on duck stamps is the 'junior' version. Introduced in 1991, the Federal Junior Duck Stamp sees thousands of young people compete for the winning stamp design each year. 'The winning art is made into the Junior Duck Stamp, which sells for $5 and is purchased by hunters, students, parents, conservationists and others,' explains Patricia. 'Proceeds from Junior Duck stamp sales go directly back into running this environmental education programme.' Clearly this has been a success, with 27,000 children taking part this year. Federal duck stamps are not the only duck-themed stamps issued in the USA and popular with collectors. 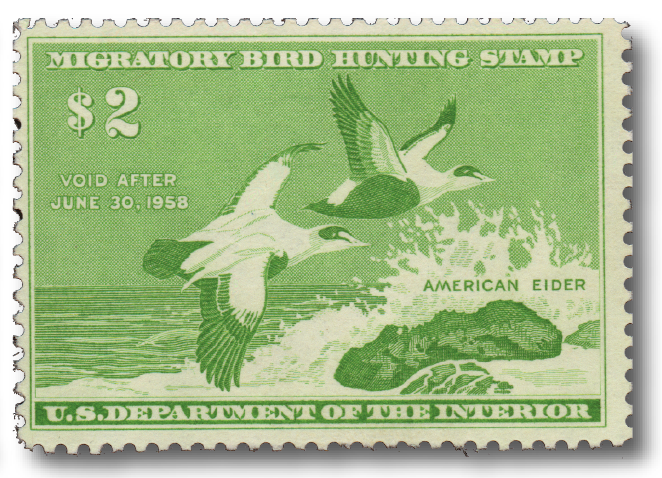 The success of the first examples led to many states issuing their own stamps to be fixed to waterfowl licences, and it was Pymatuning Lake in Ohio which started the trend in 1938. Other states followed, however California was the first to issue a pictorial duck stamp as part of a continuing series in 1971. 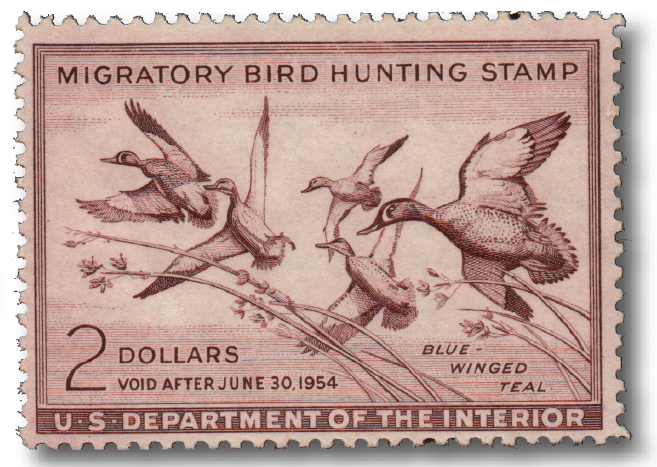 Most states in the US have issued similar stamps over the years and the subject is not limited to the feathered variety, with many different animals and fish being depicted and benefiting from the funds raised. Governor edition stamps are also issued to raise additional revenues for conservation programmes and are signed by the Governor. As only very few are printed they have become popular collectables. In the 1980s and 1990s other countries saw how well the duck stamp scheme worked in the US and began issuing stamps to raise funds for their own wildlife and environment. These included Australia, Canada, New Zealand, Sweden, Spain, Israel, Iceland, Mexico and Russia. In Britain the Wildlife Habitat Trust (WHT) commissions artists to design duck stamps and one is usually issued in July each year for £5. A comprehensive collection of American duck stamps charts the many changes to the designs over the last 75 years. While the purpose has stayed the same, the stamps themselves have certainly altered. 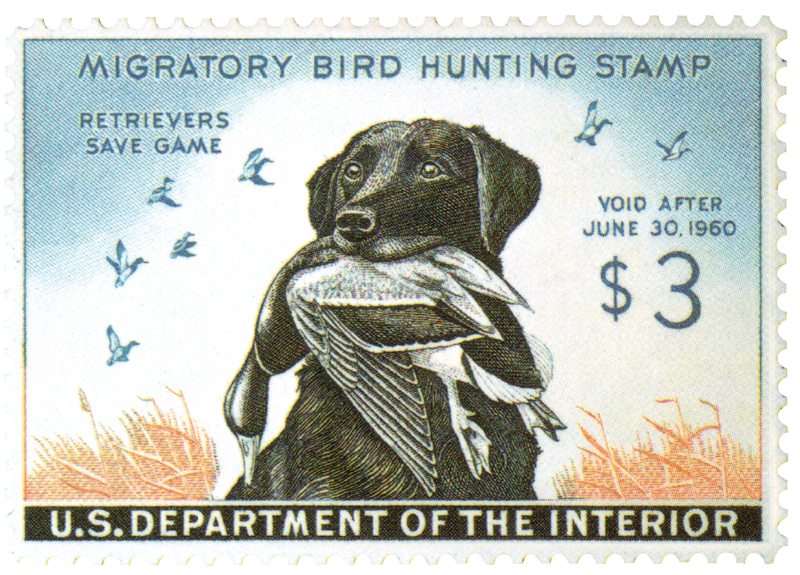 Since 1971 the stamps have been issued in full colour and the rules have changed to specify that a live duck or goose must be the primary and predominant feature of the stamp – the 1959 issue showing a hunting dog with a duck in its mouth was relevant to the stamp's use but hardly sympathetic to its cause. The Federal Duck Stamp Program also encourages designers to include landmarks such as lighthouses in their work, an added incentive to the thematic collector. 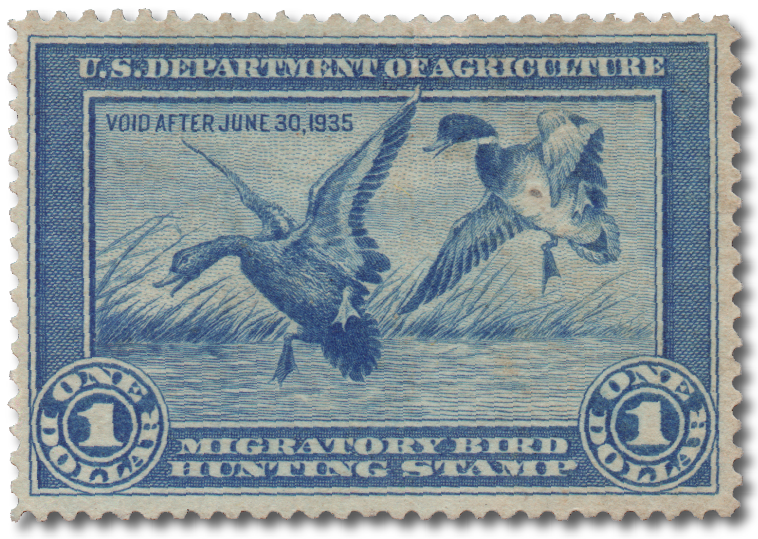 Like most areas of philatelic study, duck stamps can provide as little or as much distraction as the collector desires, but in these times of economic and environmental anxiety it is satisfying to know that the collection of some stamps can result in a positive outcome as well as a rewarding pursuit. The most popular format for collecting is mint, unused, and for US federal stamps this means collecting a single stamp for each year since 1934. There are variations to pursue, but a study may not require quite as much research as a stamp intended for postal use. Plate blocks also present more opportunities for in-depth study. 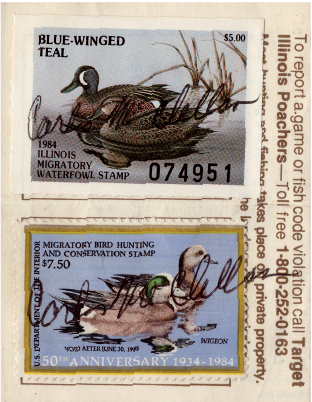 All federal and many state duck stamps are printed in sheets with marginal markings, including their plate numbers, however these vary in how easy they are to find. The best place to buy duck stamps is from a specialist dealer. How can I find out more about duck stamps?